I've always been into fenders but recently I've come to realize that I just find Gibsons easier to play, and I enjoy the thicker sound. I also love putting guitars together so I got to thinking.. why not do a sort of Gibson-ish Jazzmaster? I find Jazzmasters the most comfortable and coolest looking Fenders, and I think in some ways Leo had his eyes on Gibson when designing it. (Wasn't it the 1st Fender with a rosewood board?). So why not take it one step further into Gibbo land? I know, it could be a crap sandwich, but possibly also could be excellent. For me, that's a favorable combination of Fender/Gibson traits. Last edited by bierce85 on Mon Mar 19, 2018 7:21 pm, edited 1 time in total. Interesting timing. I have ordered a Warmoth 24.75" conversion neck for my CIJ Jazzmaster. The Fender offset body has always been the most comfortable I have ever played, but the Gibson (24.75") scale is more comfortable for my hands now too. 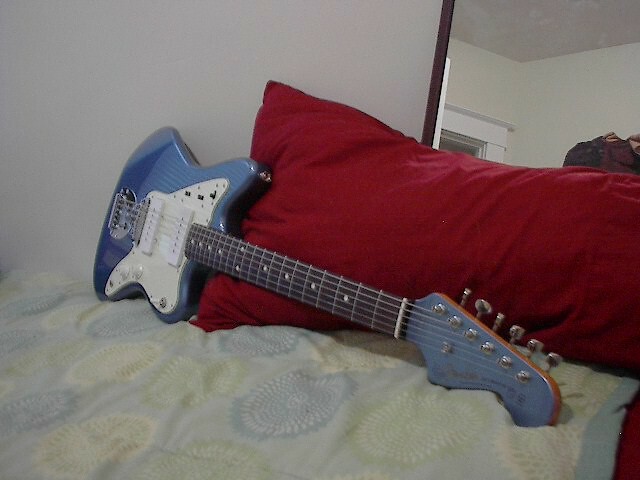 I believe at least Fender thought about the neck scale more because of the way they stick out more on Jazzmasters, hence the Jaguar. I haven't made up my mind about the pickups yet, but I will definitely replace the factory Japanese pickups. Plus, the original switches and shielding all appear to be very sub-par, so those will go too. Have toyed with idea of installing humbuckers in a Jazzmaster sized ring, but want to maintain a good single coil tone with split wiring. I know, cake and eating it. However, the more I listen to traditional sounding Jazzmaster pickups, the more they grow on me. The interesting thing about the short scale on a Jag is that not only did they chop a full 1.5 inches off but they also crammed a 22nd fret in there, which might be why many find it a little cramped. for the PUs, I've found myself more and more liking hotter bridge/underwound neck combos lately so the P90 with standard Jazz combo makes sense for me, and it keeps with the idea of splitting the difference between Gib/Fender. My neck is still 3 to 4 weeks out. Color coat today......... Used Madison's Music PB nitro and a very small amount of Reranch tinted clear over the top. Just got word today that my new 24.74" conversion Warmoth neck will delivered next week. Finally, clear coated, sanded and buffed out the body. Then, some time in the freezer to get some nice checking happening. Thanks man, I actually finished it up a while ago but forgot to update the thread. Not sure why the old pics arent showing anymore. Man, what a gorgeous shade of blue.